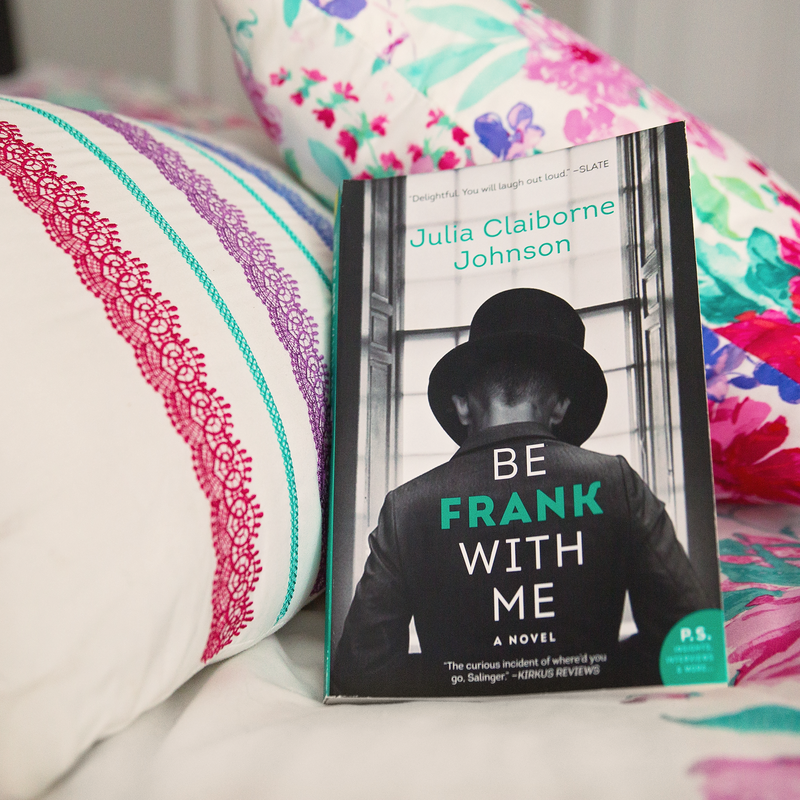 Be prepared to fall head over heels in love with Frank Banning, the quirky son of M.M. Banning, the reclusive author whose first (and only) published book at the age of nineteen shot her to immediate fame and made her book a staple in school classrooms across the world. When the fame and ardent fans became too much for M.M. Banning (known as Mimi), she secluded herself in her glass house in Los Angeles and cut off contact with most of the world. However, financial troubles have caused her to promise a new book in exchange for a hefty advance, and her publisher is all too willing to comply…with one condition. That condition is named Alice, and as an employee of the publishing company, she is sent to stay with Mimi and help make life as easy as possible for her…and keep an eye on her progress…as she completes the book. What Alice isn’t prepared for is the task of caring for…and loving…Mimi’s son, Frank. Okay. Now that a bit of a summary is out of the way, where do I begin? I will admit that this book initially left me speechless. I sat on my couch and sobbed giant tears for quite some time before I felt like I could process all the emotions it evoked. There were many moments in this book where I laughed out loud, but there were just as many that left me choking down tears. Although Frank is never given a label, the signs of his autism are pretty clear. He craves deep pressure, has problems with loud noises and change, and has frequent meltdowns throughout the book. As the mother of a child with autism, although one with a more severe form than Frank’s, this book somehow managed to capture every bit of the joy, frustration, and fear that accompanies loving someone deeply with the disorder. During the times when Alice became frustrated with Frank’s behavior, I understood. During the moments where Mimi expressed her fears for Frank’s future and her deep love for him, I felt my heart explode a bit. And during all the moments where Frank captured Alice’s heart, he captured mine too. Alice’s journey to understanding and accepting Frank the way he is was beautifully written. Around the midpoint of the book she says, “There’s nothing wrong with Frank that can’t be fixed.” When I first read that statement I was furious with her for not understanding that Frank was perfect the way he was, and that frustration reared its head at other times when she lost her patience with him or failed to understand his quirks. However, her emotions and reactions to Frank’s behavior were normal. As the mother of a child with autism, I like to tell myself that I understand my son 100% of the time. The truth, however, is that my understanding and patience has been a long journey since his birth. Alice’s time with Frank was a journey in itself, and her transformation by the end of the book is primarily what left me speechless. As for Frank, my heart simply broke for him at times. His struggles with school, in particular, and issues of his personal safety caused me to confront my own fears for my son head on and to physically shake with anxiety as I read because I saw so much of my son in Frank. Simply put, I felt as though Frank stepped from the pages of the book and became a real boy, and I loved him. Meanwhile, Mimi frustrated me to no end with her harsh treatment of Alice and irresponsible decisions and disregard for Frank’s feelings…but I also found that her love for Frank ran deeper than any of the other characters in the book could understand, and her complex personal history and conflicted relationships with her own mother and brother, Julian, had left her with psychological issues that changed her, fundamentally, as a person. Julia Claiborne Johnson has done a spectacular job of exploring the emotions associated with caring for a child with unique needs while also crafting a plot and characters worthy of praise for their creativity and depth. Be Frank With Me is a new favorite of mine, for sure, and one that everyone should read. Posted in FictionTagged book review, Fiction, quirky charactersBookmark the permalink.